Eset Multi-device Security 9 offers an intimidating number of options for various platforms. But it is not without its faults. Protection for all major platforms such as Android, Linux, macOS, Windows. As the name suggests, ESET Multi-Device Security Pack is a software application that offers protection for almost all major platforms and devices. But all that protection will cost you a good amount of money. Moreover, our research shows that ESET doesn’t offer consistent protection across all major platforms. All types of malware tend to target computer machines that are running the Windows operating system. In other words, Windows has to bear the brunt of most major malware attacks, hands down. Of course, hackers have brains too. And they know that Windows isn’t the only platform that people use nowadays. A lot of modern online users run multiple different operating systems on their devices. Hence, in order to protect them all in one go, you would want a security suite that has the capability to protect all those devices. With that said, if we go ahead and compare ESET Multi-Device Security 9 with some of the best competitors in the market, then it is certainly less effective. And more expensive, if that makes any sense. Moreover, the other problem with ESET Multi-Device Security 9 is that it doesn’t offer any iOS protection. So if you own an iOS device and want to protect it, ESET Multi-Device Security 9 isn’t going to cut it for you. ESET Multi-Device Security 9 is basically a bundle. And for some reason, ESET continues to change its price rather quickly. In other words, ESET Multi-Device Security 9 used to cost users around $84.99 in exchange for six licenses. At the same time, you can also pay for the same service at about $99.99 for a total number of 10 licenses. That pricing model has changed now. ESET Multi-Device Security 9 now starts offering its services at $79.99 for a total of three licenses. Users have the option of signing up for further licenses. The maximum number that ESET Multi-Device Security 9 offers off the bat is 10. So each of the additional licenses that come after the initial offer of 3 cost users $10. Hence if a user wants to apply for 10 licenses with ESET Multi-Device Security 9 then he/she will have to shell out around $149.99 for those. You don’t need us to tell you that, this pricing model is steep. With that said, there are more expensive options. Take a look at Panda Gold Protection. It charges users around $149.99 for just three individual licenses. So ESET Multi-Device Security 9 is definitely not the most expensive all-device security solution around. Another ESET Multi-Device Security 9 competitor is Symantec Norton Security Premium. Symantec Norton Security Premium offers users a total of 10 licenses along with online backup storage worth up to 25 GB for a total price of $109.99. The market now also has seen security suites which try to stay away from putting hard limits on the total number of device licenses. You also have other all-device security products such as McAfee LiveSafe. McAfee LiveSafe offers users to protect all their devices with just $99.99 per year. In other words, there is no limit to the number of devices that you can protect with McAfee LiveSafe. We have already mentioned that ESET Multi-Device Security 9 doesn’t offer iOS protection. So you have to keep that in mind when moving forward with this review. When a user has successfully purchased ESET Multi-Device Security 9, the company sends the user an email. The email basically contains the download link. It also contains the official license key. All the user has to do is click on the link. And then download the required software. After that, it is just a matter of installing the software. All of that is fine but we did encounter one disappointment. The ESET Multi-Device Security 9 download page doesn’t have the capability to detect the user’s operating system. And hence it can’t automatically offer you appropriate choices for your devices. Instead of that, users must click and then choose options such as Linux, Android, Mac, and/or Windows. To take an example, if a user is on an official Windows box, then the company will give that user the license to install one of its two security products. These two security products come in the form of ESET NOD32 Antivirus and ESET Internet Security. We’re not really sure nor clear as to why would any user want to install the company’s standalone antivirus solution when the company as clearly offered its entry-level suite for download. Nevertheless, it is still an option. And the more the merrier. Similarly, the company offers two options for Mac users as well. Mac users can either go with installing the company’s basic security solution in the form of ESET Cyber Security (designed especially for Mac). Or they can just go ahead and download the company’s Pro edition. As you can probably tell, the choice presented in the case of Mac users isn’t as clear as it was in the case for the Windows users. The point that we want to make here is that a lot of online users don’t really have a need for parental control. Moreover, an even greater percentage of online users might not even care if a security solution comes with a personal firewall or not. As far as the Android platform goes, the company allows users to install its ESET Mobile Security. This security solution is specifically made for Android. There is also ESET Parental Control for Android. Just as before users can either opt to install one of the given two options or they can install both. Readers should keep in mind here that whenever they install a software on a given device they actually use up one of their license keys. That also holds true for the company’s mobile security apps. In other words, every installation counts. There is one exception to this rule. We have come to know that a single official license allows any user to install the parental control feature on any and all of their Android devices. That takes care of Windows, Android, and Mac OS. What about iOS and Linux? Well, we have already mentioned the fact that ESET Multi-Device Security 9 doesn’t have any protection for the iOS platform. It does have protection for Linux users though. Users who want to protect their Linux boxes with ESET Multi-Device Security 9 can make use of ESET NOD32 Antivirus which the company has specifically built for the Linux Desktop. Or more like shared features. As we have noted before as well, users have the option of installing either the ESET Internet Security or ESET NOD32 Antivirus on their Windows machines. You’re going to have to read the full review to find out the details about what you get with each of these security solutions. But why do we mention them when ESET Multi-Device Security 9 simply does not offer them? Well, we mention these advanced features because users who subscribe to ESET Smart Security Premium to get to use these features. To put it another way, ESET Multi-Device Security 9 is not the company’s top-of-the-line security product. The good thing about ESET Cyber Security (available for Mac users) is that it has already managed to receive certifications from a couple of good independent testing labs that regularly perform related tests for the macOS platform. The ESET Cyber Security for Mac comes with its own set of features such as an elaborate scheduling system. That is highly unusual based on our research. 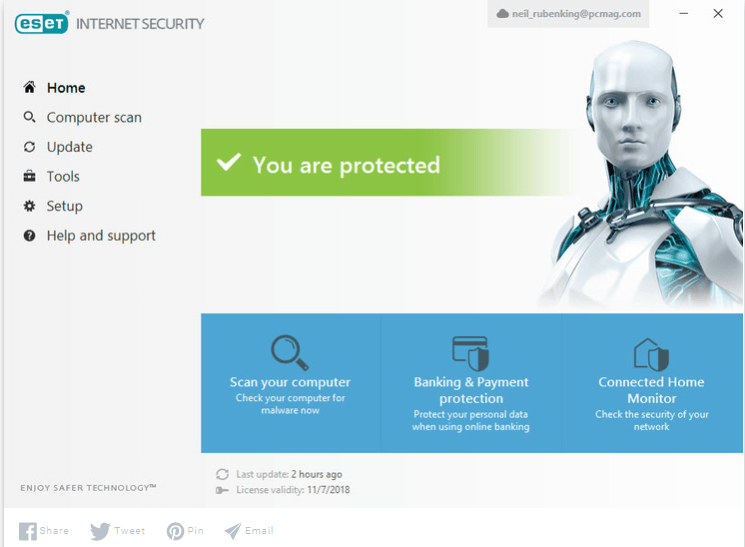 The Mac version of ESET Cyber Security also offers phishing protection. Unfortunately, our research shows that the phishing protection feature doesn’t perform well in many hands-on tests. Regardless, ESET Cyber Security for Mac comes with many other bonus, and perhaps useful, tools. Read the rest of the ESET Multi-Device Security 9 full review to find out if it is the right fit for you. Perhaps the term added features is more suitable rather than Extra features. 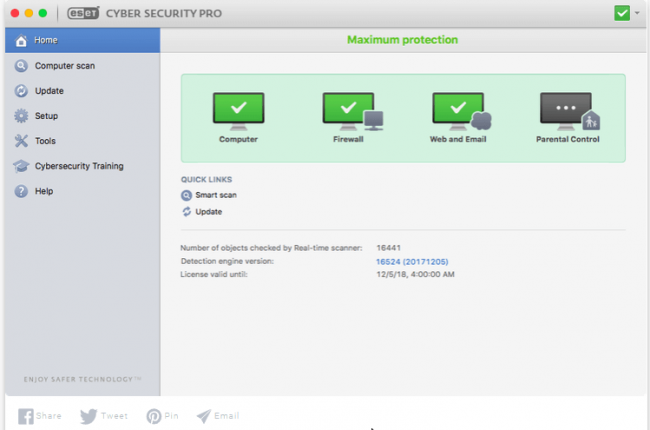 ESET Cyber Security for Mac also comes with a Pro edition. The Pro edition allows users to make use of other components like parental control and firewall which are not available in the basic version. Whenever a user tries to connect to a new network, the firewall component of this security product asks the user whether it should treat the new network connection as Public, Work or Home. Based on the users choice, the security product configures its firewall rules. 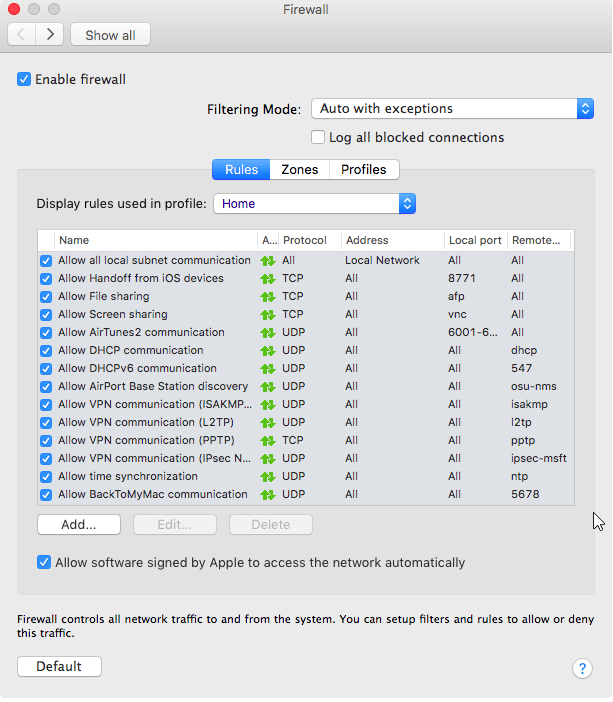 Users who want to have more control over their network can dig into extended settings which offer a complete view of all firewall rules. Although it is another fact that it is likely that most users would find those options a bit incomprehensible at first sight. That is the reason why we recommend here that users shouldn’t hasten to make changes to their firewall rules unless they are very sure what they are doing. Or are a trained expert. The firewall that comes with the ESET Cyber Security Pro edition handles al application permissions on its own. But that is the default setup and you can change it if you want to. Users have the option of selecting the product’s interactive mode. This mode tries to send the user a query each and every time an unknown or new program tries or attempts internet access or a new type of network. In addition to all the previous options, the firewall can deny and allow internet access to any program and/or application. Users who deem it fit can choose to create some new rules concerning specific programs. After users have done so, the program won’t ask the users about those programs again. Moreover, users can also program the firewall in such as way and it remembers their answer unless and until the process itself terminates. The security suite also comes with a Profiles tab. Using this section, users have the opportunity to create new profiles. They can base their new profiles on Public, Work or Home categories. After that, they can also dig in a bit more to modify the default rules. For the average user, we don’t think there is any reason to mess with the default settings. The macOS Cyber ESET Cyber Security also comes with a Zones tab. The Zones tab is responsible for displaying a button and an empty list that users can add a zone to. Again, this is another advanced feature that regular users should stay away from. We didn’t understand this feature the first time either. But fortunately, our research allowed us to notice the help button feature. Our research shows that you can click the help button to receive a message which should show you some help. So does the button really help? It will only show you a message which would tell you that the content you requested was unavailable. Hence, for regular users, or users who are short on time, the best route forward is to just relax. And let the firewall do what it knows how to do. We found the default settings as very satisfying. The Cyber Security Pro edition throws even more option at you if you want it to. For example, if you enable its parental control feature, then the security product will bind you to select a role for each and every user account. When the user has configured the user accounts using the above categories, then the parental control feature automatically adjusts the content filter with which it blocks a selection of content. The parental control feature makes use of more than two dozen categories of content to filter the un-filtered content. There is always a chance that the default settings won’t suit some of the users. For those type of users, the ESET Cyber Security Pro edition offer some fine-tune selection feature as well. Our research shows that if you turn on the content filter which corresponds to the Teenager level for a specific account you should notice that the software will correctly block any and all the usual naughty websites. Of course, you will have to try out those sites yourself just to make sure that the content filter is indeed working. Our research also shows that the content filter works so efficiently that it can even block some lingerie sites such as Spanx and Victoria’s Secret. With that said, we also found that the content filter didn’t do much to prevent or block an image search which related to naughty pictures. Expect the content filter to NOT block content when you search for images with the term “naked girls”. So any search related to more naughty terms like the one we mentioned above will likely get you an eyeful. Moreover, our research also shows that if you click enough times then some of the links that are present in the images search engine can actually allow you to reach whole websites which are devoted to all kinds of lewd images. Additionally, the ESET content filter doesn’t have much effectiveness against HTTPS traffic. In fact, it doesn’t have any effectiveness at all when it comes to HTTPS traffic. And we know what teens are like since we were all once teens. Any clever one of us wouldn’t need much to come up with a way to evade such kind of filtering. All that one really needs is a secure and anonymous proxy website. Perhaps this is a good time to mention that most modern versions of Apple’s mac OS have built-in parental controls. These parental controls allow adults (supposedly parents) to prevent the use of specific apps. The built-in parental controls also limit website access. Not only that but the macOS built-in features can also take care of other things. Disabling access to the Apple iTunes store. Users can also configure it so that it only allows those apps, shows, movies along with books that come with age-appropriate ratings. The latest version of macOS also comes with the time scheduling feature. Add to that other features which include a simplified desktop along with other nifty options and you have a pretty well-rounded operating system without the need for a third-party parental control guide. “Try to limit access to adult websites”. This seems like a decent option. But it doesn’t furnish users with detailed control over various other and different content categories. So it makes sense that someone would try to turn off the ESET parental control and work with the built-in parental control. Our research shows that the built-in parental control feature in mac OS will correctly block many raunchy websites. With that said, it didn’t bother to block sites which had something to do with lingerie items and such. 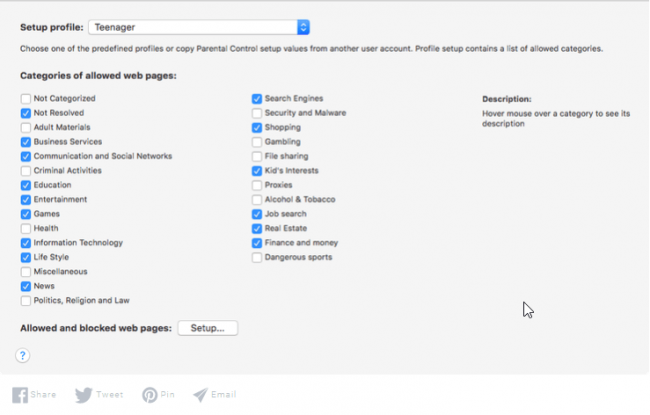 The built-in macOS parental control feature also forced Safari to use Safe Search. Although it couldn’t do the same for Google Chrome. To our surprise, it even managed to filter HTTPS traffic. But just as before, it could do so only in Safari and not in Google Chrome. Some users may not want a sophisticated parental control suite. Some only need to keep their kids away from sites with adult content. For that purpose alone, the mac OS built-in parental control system offers better protection that ESET Cyber Security Pro edition’s content filter. That is strange, to say the least. So our recommendation is to simply use its official app control page to block, prevent and/or deny your kids any other web browsers apart from Safari. This security product is only available for Android. No such luck for iOS users. The ESET Mobile Security for the Android System is actually a full-featured security suite. It also has the capability to filter phone calls as well as text messages. The ESET Mobile Security has other offerings as well. Let’s talk about the antivirus for a bit now. The antivirus comes with a scan that works at around two different levels. The first level is the Smart level. And the second level is the In-Depth level. Depending on your smartphone device, the results are bound to wary. So keep that in mind while you read the rest of this Android section. 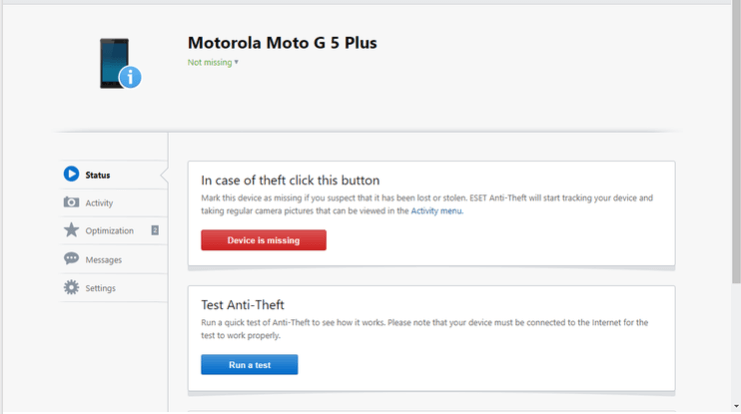 If you have a modern and slightly powerful smartphone such as a Motorola Moto G5 Plus, then the Smart scan feature should not take your smartphone more than a few seconds to finish. If it doesn’t find any problems, then it will report so. And if you thought that the in-depth scan would take a bit longer, then you thought wrong. But it certainly won’t cross the finish line as quickly as the Smart scan either. The ESET Mobile Security antivirus component also checks for new apps as soon as they become available. Therefore, users can easily set the antivirus to scan when their smartphone device is charging. Users can also avail the option of scheduling where the antivirus would perform automatic scans on single or multiple days of any given week. ESET Security Suite also allows users to manage the security product’s anti-theft component. Users can access this feature with the official ESET online console. That doesn’t mean there aren’t any other ways to access it. This feature is also available in the Windows version of the ESET Security Suite app. The ESET online console also presents an option for users to send a coded text to any of their devices in order to wipe it, lock it or locate it. The reason why we mentioned the online console method first is that it is considerably easier to use than the Windows version. 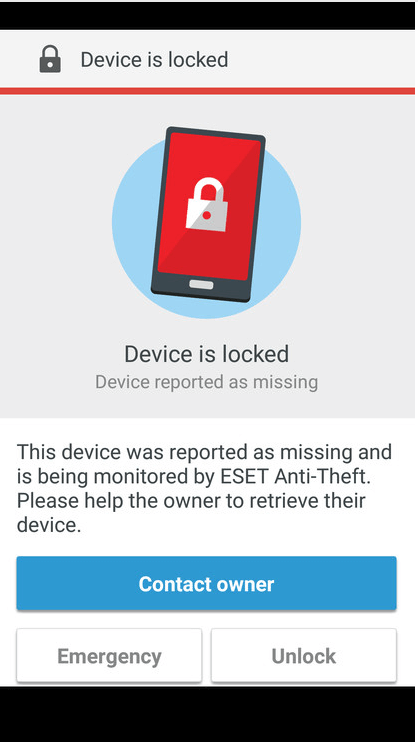 When a user uses the feature and marks a device as a missing one, then the ESET Mobile Security suite locks that device down. Then, the Mobile Security Suite displays a type of warning page. This warning page gives out three options. If by chance a helpful person found the device then that person can simply tp the lost phone in order to contact the owner of the device. The other option is for the owner of the smartphone. If the owner finds it, then the device will ask for a password with which the owner can unlock his/her device. Usually, the Security suite will ask you for the password during the installation process. There is also a button for the user to make an emergency call. 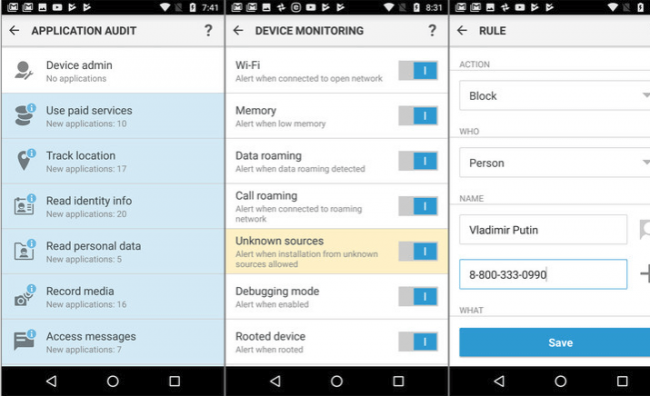 An emergency call from a locked device? And you’re also right in the sense that this isn’t something you see often in any security suite. So what happens if you just can’t find your device? Well, the Mobile Security suite continues to regularly report on the current status of the user’s device. It continues to do so for a period of two weeks. While doing so it continues to make regular reports on the device’s location. It also uploads photos and does all the hard work of finding the device’s IP address. Just to take an example, if the Security suite’s location report manages to reveal that user is close to the lost device, then it will give the user the option to tap and start a reasonably loud siren in order to help the user find his/her lost device. But what happens if you have hopelessly lost your device? Well, then it gives you the option of a WIPE. The wipe option will remove all data from the smartphone device. It can also report if the user has recovered his/her device. If we’re talking about anti-theft tools then perhaps this is a good time to mention Bitdefender Mobile Security And Antivirus that comes custom-made for the Android smartphone. It offers users quite the similar toolset. But along with that, it manages to add just one more unusual feature. Once Bitdefender can verify that the user has paired his/her device with an Android Wear device (usually a watch) then it gives out a warning sound if and when the user walks away from his/her device leaving the smartphone device behind somewhere. There is also an anti-phishing component. The good thing about this anti-phishing feature is that it integrates with Chrome without any problems. It can also integrate with many of the other preinstalled stock web browsers. When this security product detects that the user is about to visit a website that it considers as fraudulent then it quickly displays a prominent warning screen. Not just that, it also allows the user to select whether the user would like to proceed to the page or avoid the said page. Our advice is always to not proceed when your security suite tells you of a fraudulent website. ESET Security Audit actually warns users if they have connected to an insecure Wi-Fi. It goes one step beyond the call of duty by reporting on settings which hinder the user’s security. If the user has allowed his/her smartphone to install apps from unknown sources then the Security Audit will give out a warning. If the user has enabled the debug mode then the Security Audit feature will, again, put out a warning message. Additionally, the Security Audit feature can actually warn the user if the user’s device is close to running low on memory. Perhaps the most important function of the Security Audit feature is that it regularly checks all of the user’s apps. And then makes a report of it. And then mentions any to which the user may have given potentially risky permissions. The Security Audit feature also comes with the capability to report apps which might have had the smartphone device’s administrator privileges. Remember, administrator privileges are potentially very dangerous. Because apps can use administrator privileges to gain a status which gives them an uncomfortably high degree of device control. Users have the option of tapping each category and then reviewing the displayed lists of apps. If they see that anything looks off or fishy, then they can take some action. But before you go and clean up the house, we want you to know that if an app like Google Maps has access to your location then that probably makes sense. On the other hand, if your device’s flashlight app has come up on the location permission list, then it is probably a good idea to uninstall that particular flashlight app. We would also like you to note Norton Security and Antivirus for the Android smartphone Security Audit feature. Norton’s take it to another level when it comes to reporting. It takes the concept of listing apps requesting unnecessary permissions and then warnings about those iffy apps even before the user has started to download them. Users should also understand that the features we have described so far are applicable to smartphones as well as tablets. If a user is on a smartphone, then the user can easily configure ESET Mobile Security to automatically detect the SIM card switch. After that, the user can have the ESET Mobile Security send all the new SIM card details to someone the user trusts. Other features such as call filtering help users to take control of who calls them. What about the text filtering feature? Well, it only works if you have a rather antiquated Android smartphone. In other words, if you are running a version that is older than Android 4.4. But that really isn’t a flaw since none of the competing products can offer anything better. Users can create rules for specific numbers, groups, individuals in their contact list. They can also set rules for numbers that are non-existent in their contacts list. The ESET Mobile Security also enables rules for hidden numbers. If the user wants to then he/she can make a specific rule for things such as the last call they received on their smartphone device. Moreover, there is even a special option which users can make use of and define which rule they want to be applied when. To take an example, the user could easily use the ESET Mobile Security suite to ban nighttime calls. Or they can ban them only for those users who are not on their most important contacts list. The ESET Security Audit component is not a slouch b any means. Its reports do have a couple of entries for the user’s smartphone device itself. More specifically, the Security Audit component can warn users when call roaming and data roaming features are active. From an overall perspective, the ESET Mobile Security suite has just about every feature that one could want in a mobile security product. And as we just mentioned, it works for both smartphone devices as well as tablet devices. We think that ESET doesn’t offer a whole lot of parental control when it comes to its Windows and macOS apps. In fact, bare minimum, is the word we should use. The only thing that the parental control component does on Windows and macOS is filtering inappropriate content. And then it makes a report of the pages it blocked. By contrast, the Android version is a genuine full-featured and effective parental control tool. As far as the Android goes, the ESET Parental Control software also comes as a standalone product. Fortunately for you, that standalone product is precisely what ESET offers users with its ESET Multi-Device Security 9. We don’t go into the full review of ESET parental control here. But we will summarize what we think about this ESET Multi-device Security 9 component. ESET offers all of its users a single app when it comes to parental control. And the app comes with a parent mode plus a child mode. Kaspersky Safe Kids and Norton both already do that for Android. Users can switch to their parent mode if they just enter their password. Similarly, they can enter the child mode back again with a single tap. It doesn’t take a genius to figure out that most parents would like to install the ESET parental control Android app on their own smartphone devices that are running the Android operating system. Some parental control utilities differentiate them with control. Others do the same with communication. ESET belongs to the second group. You have this main window of the ESET Parental Control child app and it lays out a nice little screen with all the rules. It uses simple language so that there is little chance of any miscommunication. Norton Family Parental Control, similarly, has House Rules for the Android platform. While users are free to use ESET’s parent app in order to configure the app but our research shows that they would have an easier time of managing settings if they used the online console instead. The online console allows users to first define and then configure profiles for multiple numbers of children. Actually, it doesn’t have a set limit on the number of children you can control with profiles. Moreover, users can also associate each of their children with a multiple number of devices that are running on the Android platform. There isn’t a hard limit on the number of Android devices per child either. You also have the Web Guard feature. Users can configure its content filter function to allow or block over 35 working content categories. Other options include the ability to only monitor unwanted categories. That would, of course, mean that the Web Guard won’t block any content. The good thing about the Web Guard is that it can handle HTTPS sites as well. Hence, your above-average kids won’t have the opportunity to slip past it even if they try to do so with the usual methods such as with the use of a secure and anonymizing proxy service. 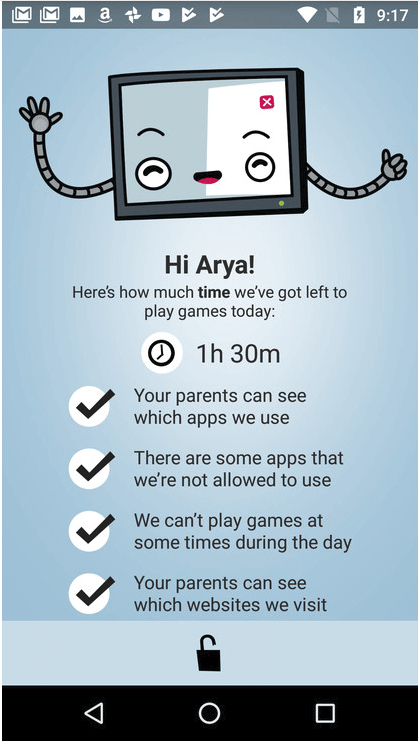 The ESET Parental Control Android app has another face. It’s called the Application Guard. It basis its monitoring and categorizing on the user’s chosen age range. The Application Guard component can identify each and every app in terms of three categories. This means that it won’t allow access to that app. Apart from that it also gives parents the power to apply some due daily limits on the use of certain apps in Application Guard’s Fun & Games category. If that sounds too controlling on part of the parents then the Application Guard can also set a necessary and manageable weekly schedule. Following the schedule, it would manage the time when the child can and can’t use certain apps. 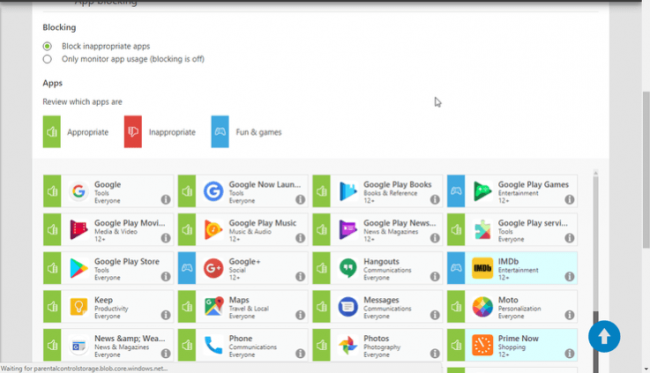 And just like with ESET’s content filter, users have the option to either just monitor app usage or monitor and block app usage. Users can either use the parent-mode app or the online console to access system reports. These reports give the user a complete overwise of any recent activity. Users who want to dig in for more details on the websites that the software has blocked can do so via the reporting system. They can also take a look at any visits that someone made to inappropriate or appropriate sites. Users who have set the ESET utility to only monitor activity and not block anything can only view stats which are related to visits that were made to inappropriate websites. Moreover, the online console and the parent-mode app also allow users to view stats for different time periods. The ESET official parental control app also produces reports on app usage. Users have the option to categorize them over similar choices of time periods as before. The app also breaks out the app usage which the user has defined as Fun & Games in a separate space. We also experienced a rather unusual usage heat map. This heat map basically charts the user’s device usage over a period of time. By default, it maps usage for each and every hour of any given day. So if a parent sees the heat map and notices that the child used the device a bit too much especially when the child should have gone to sleep, then perhaps that’s the perfect time for a long conversation. The ESET parental Control app for the Android system is a good piece of software application. But it doesn’t offer every parental control function or feature that the user could need. For example, the ESET Parental Control app doesn’t allow users to locate their child. They can’t monitor texts or calls. With that said, it is effective. In fact, it is vastly more efficient and effective than the company’s parental control applications for macOS and Windows. ESET Multi-Device Security 9 enables users to use the company’s licenses in order to install good protection on their devices. It doesn’t any compatibility for iOS devices. Moreover, we have also come to know that the protection it offers is inconsistent across different platforms. For example, ESET Multi-Device Security 9 is great on Android. The Android version comes with a powerful anti-theft tool and an antivirus. It also offers a full-featured and effective parental control Android app. While on the Windows platform, we were satisfied only with the antivirus feature. The rest of the features such as the personal firewall and parental control feature did not impress us that much. Moreover, on the Windows platform, the company doesn’t offer the best features of its top-tier suite. As far as the macOS platform goes, the company does offer an antivirus along with parental control and firewall feature but just as in the case of Windows, they are relatively weak. Therefore, our recommendation is still tilted towards Symantec Norton Security Premium if users want a true cross-platform and multi-device online security suite. Symantec Norton offers 10 licenses and charges way less than ESET Multi-Device Security 9. Moreover, Norton allows you to install good protection on your iOS, Android, macOS and Windows platform. With ESET Multi-Device Security 9 you miss out on protecting your iOS devices. In addition to a cheaper service, Symantec Norton also supplies users with 25 GB of free online storage which users can use for backup purposes. But even though Symantec Norton supports the iOS platform, its service is weakest for the iOS. That isn’t because Symantec Norton is lazy or anything. It’s actually because of all the limitations that Apple employs on its operating systems. As far as the protections on other platforms go, they are superior in every sense of the word. Overall, we would rank ESET Multi-Device Security 9 as a good option for anyone trying to protect all his/her devices. But there are better and cheaper options available if one bothers to look for them. Firewall Application: Do You Really Need One or Are You Better Off Without One ?